Fresh Dish is a meal delivery service that delivers fresh, NOT FROZEN meals to your door! (check you zip code for availability.) The menu changes weekly and you can select quantities of 2 or 4 servings. The price per meal is $24.00 per 2 person meal kit or $32.00 per 4 person meal kit, with free delivery when you order 2 or more meals. There is currently no obligation to sign up for any type of subscription so you can order any week you want (or not, if nothing offered that week floats your boat) and you choose which day of the week it is delivered. You can sometimes find flash sale site deals (ie. Plum District or Groupon) offering discounts that amount to a 2 for 1 deal, which would bring the cost down to $12.00 and $16.00, respectively and that is a AWESOME deal! “HOME-COOKED MEALS MADE EASY” They aren’t kidding, everything is pre-measured, labeled an takes 30 minutes or less to prepare. You just provide the kitchen! 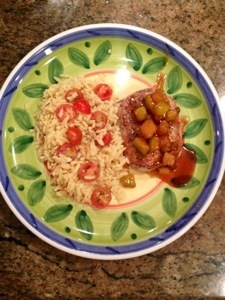 First peek at the Pork Chops with Chutney and Orzo. 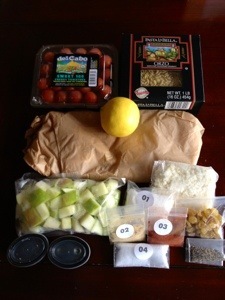 Full containers of both Orzo and Cherry Tomatoes! All of the ingredients laid out. They make it so convenient by numbering and matching up the smaller items to the instruction card! 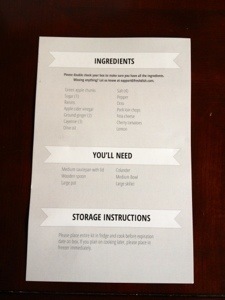 The list to verify ingredients in your box, plus the equipment you will need. The directions are on the other side! This meal was good, it was a bit spicy for the kiddo (note to self: don’t use all of the provided Cayenne) I was amazed at how many ingredients and full sized packages they not only included by managed to fit in the box! We are still huge fans of Fresh Dish, and I have several more meal reviews planned for the near future !! Bon Appetit!